One of the things that pro-style quarterbacks are expected to do is read defenses and make checks at the line of scrimmage, though less so on the college level. A key component of Denard's transformation from spread prodigy to drop back passer will be his ability to recognize defensive fronts and make the proper adjustments. 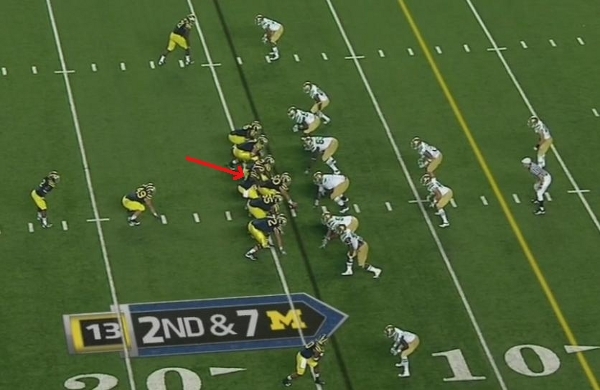 There is a fairly basic check, though, that Denard used against Notre Dame: the This Is Going to You check. It's early in the fourth quarter and Michigan is down by 10 points. After calling a timeout at the 14 yard line, Michigan comes out in an I-formation with Junior Hemingway to his left and Jeremy Gallon to his right. 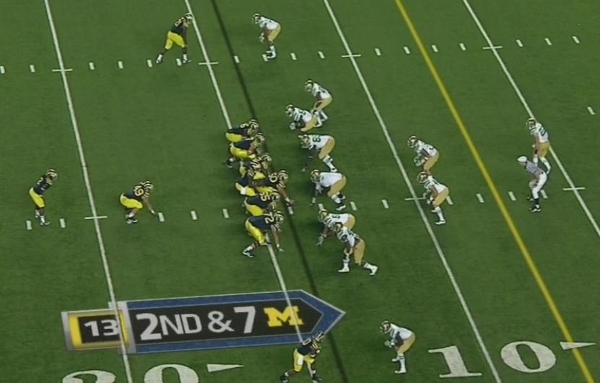 Notre Dame is showing an aggressive, man coverage front with a single high safety. If you were wondering why Al Borges called for a back shoulder fade to Jeremy Gallon in the endzone, especially when Denard had single coverage against Junior Hemingway on the other side of the formation, it's because he didn't, Denard did. Clearly I don't know how much freedom the offensive staff has given Denard or whether or not they'll allow him to make seemingly illogical checks like this at the line in the future, but Denard must have seen something he liked because Gallon caught the touchdown pass that started Michigan's fourth quarter rally. While this play itself isn't necessarily that interesting, it's the concept behind Denard's audible that intrigues me. We haven't seen Denard make any actual audible calls at the line of scrimmage this year, but this is practically the same thing. Denard's freedom to change the play at the line of scrimmage is something I'll be watching as the season progresses. And just as a general viewing tool, unusual signals like this are usually a signs that the play has been changed.